In a story about the Bauhaus, the Haus am Horn is featured at length in an article writtend by Eva Zimmerman. 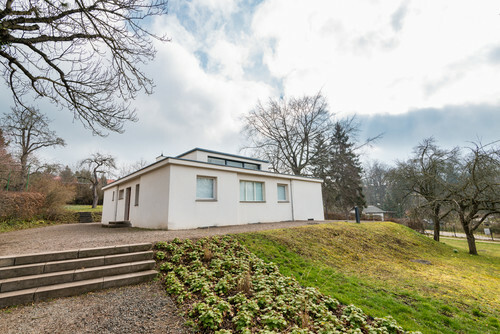 The Haus am Horn for the first architectural project by the staff and students of the Bauhaus. Built in 1923, the Haus am Horn consited of a house with all the essential furniture and other furnishings necessary for everyday life. All the Bauhaus workshops helped build and furnish the house, which emerged as a residential prototype. It was supposed to be the beginning of a Bauhaus village that would be like a university campus today. However, after the state elections of 1924, the power structure in Thuringia changed, and the new conservative administration cut the school’s budget by half. 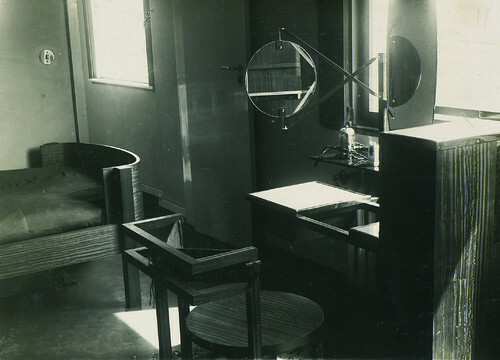 In 1925, the Bauhaus moved to Dessau, and the village did not come to fruition. Zimmerman acquired an excellent selection of photos for the piece, which includes images of early furniture designs by Marcel Breuer. And curiously, although many architects came and went at the Bauhaus, the Haus am Horn was actually designed by an artist, named Georg Muche. Interviewed for the article is Michael Siebenbrodt, the director of the Haus am Horn and curator of the Bauhaus Museum, and it's fair to say that overall Zimmerman has really done her homework for the piece, which I recommend reading for anyone truly interested in the origins of modernism. The article is found here.